A loud fleshy slap rang out as the cold iron made contact with the Akalak’s skin. As soon as it did a hand clenched down on Kynier’s wrist in a grip that stifled the blood flow to his hand. In a fluid movement the mage’s opponent hand circled around behind him. Despite his flexibility, Kynier’s shoulder burned with discomfort in opposition to the always surprising chill of cold iron along his spine. Wincing audibly as the akalak used the entanglement to manipulate his body. In the fast approach to the wall Kynier raised a foot to set against the approaching surface. When the akalak released him Kynier groaned in relief. The mage rotated his shoulder to try and ease the hyperextension as he walked a circle around the akalak and away from the wall. The blue giant was breathing heavy and had sweat applying a sheen to his skin. Kynier was in similar condition but not as out of breath. When criticizing thoughts began to form the mage cut them off. The akalak had been practicing for gods know how long before Kynier had come down to join him. Kynier clenched his jaw in frustration. Was he only able to best the warrior because of the warrior’s fatigue? Staring skeptically at the akalak at the admittance of lying, Kynier reversed his grip on his weapon and crossed his arms over his chest. Was it an actual lie? Vel had been conversational, more so than whoever this was. Even a bit snarky. As for why he was so suspicious… Kynier wasn’t going to admit to being a mage to this male. Not yet. Thankfully, being a mage was only part of his being unlike other mages he had come to know. There was still the spy to play. And for now, Kynier neither liked nor disliked the akalak. Which in Sunberth meant he was still checking to see where the daggers were hidden. “If we are to sleep under the same roof then I can do one of two things. One, I could not tell you the reason for my suspicion and we begrudgingly abide each other’s presence. Two… we give each other an extent of forthrightness.” A blue giant is not someone the mage wanted as an enemy, or as a disinterested acquaintance. Whether he wanted one as a friend was something else he wasn’t sure of. Friendships were a relatively rare occurrence for the mage. And sustaining them was something he wasn’t too familiar with. “I’m a spy,” he admitted to the akalak. “And it’s second nature for me to question and doubt what people say until their words are proven true.” Kynier took a deep breath and exhaled loudly, adjusting his feet to a slightly wider and more comfortable stance. “So then. If you’re name isn’t Vel, what is it? I’d prefer to not have to call you ‘Akalak’. And what sort of employment did our dear kelvic offer you?” His tone was light in an attempt to begin a more civil conversation. Suffice to say Kynier’s laugh had confused Aer’wyn quite a bit. A confusion which lingered in every line and curve of his face. The more time he had spent around the human the more he seemed to be thoroughly unable to get a read on his but then against, many such things existed in this god forsaken city. Things he just had to accept without truly understanding. “You didn’t a…” he began but as soon as he did, Kynier’s piercing glare halted him in his words. The frustration in him was apparent. So much so that the Akalak found himself wondering the reason Kynier had challenged him to a duel in the first place, if he was going to end up so wound up by it. Perhaps to show of his manliness? That would have made a lot of sense now, wouldn’t it? As soon as the thought came however, Aer’wyn shook it from his mind. Though having seen him once before, though the eyes of Bel, he had only truly met the man for the first time and such assumptions would be not only foolish but disrespectful. And Aer’wyn fancied himself anything but. An eyebrow raised at the way Kynier head his sword. Even if Kynier had little opinion of the akalak, in all his hypocrisy, Aer’wyn had found himself quickly disliking his adversary. Eventually however, Kynier yielded the truth of his suspicion. And the fact that he had any idea of the second soul beneath his skin, was something that Aer’wyn hadn’t even thought to consider. And thus, innocently, he smiled with his weapon lowered and his stance returning to a relaxed position. “If that’s what this is about, why didn’t you just say so in the first place?” He said, shifting his tone to the more usual warmth which he often regarded all in his presence with. He was no master of lies however. There were notes in his voice that betrayed nervousness, however. Ones that Kynier could certainly pick out with a keen ear. Seeing Kynier lighten up a little, he continued, relinquishing far more information than the man had asked of him, in order to appear as if he had absolutely nothing to hide. Whether it worked or not, it would remain to be seen. But one had to give a little, to gain a little. But just to be absolutely sure of his safety, he walked around to position himself in front of the way out of the basement, where on the second step of the staircase he sat down, hoping Kynier wouldn’t take the gesture as a threat. He leant the sword against the wall, next to himself. Aer’wyn’s eyes watched Kynier as closely as the spy watched him. He watched out for the slightest sign that would suggest a need to defend himself. But alas with that one revelation he knew he had hung his fate in the man’s hands and hoped he had made the right decision. It was a game of chess they plaid. A game which Aer’wyn had no chance to win but refused to go down without a fight. The akalak’s tone sounded mostly sincere. Had Kynier no previous impressions or encounters with the blue giant then he would’ve accepted them without much scrutiny. But there were too many inconsistencies so the spy in him, the Nightstalker, was listening more closely. The akalak’s claim of friendship by association, as well as the claim to trust, was spoken with a tone that sounded like the truth. But as the words rang in Kynier’s ears afterwards he heard the faint, reserved change of pitch in the other’s voice. The akalak wanted the words to be true, but didn’t speak the truth. Aer’wyn Grisghul. Finally, a name for the second persona. Or was this the original persona? While Kynier could understand the necessity of a false identity, and had often considered developing one himself. With Aer’wyn being an akalak, Kynier supposed that any alter ego would need to be thorough. His race was fairly uncommon in the city. He could’ve believed it all if not for the insights Aer’wyn didn’t realize the mage had. Kynier stroked his chin as Aer’wyn mentioned being hired as a guard. That made sense to him. Aer’wyn had been helpful, was capable, and so living at the Midnight Gem was the best option for keeping a guard. As Aer’wyn took his seat on the stairs Kynier wandered over to where he had set his clothes and sheaths. He placed his short sword back in the sheath and placed his shirt back on. The fabric had gotten chilled from the basement air and felt good as it absorbed the creeks of sweat along his shoulders and back. But he looked over at the akalak when he began making his revelation. Kynier’s eyes slightly narrowed as he listened. Aer’wyn was a mage. Kynier felt neither excitement nor dread to the exposed secret. It explained the hand perfectly. He tried to think back to their spar for glimpses of what his adversaries hands had been doing. But Kynier hadn’t been paying attention to those details at the time and couldn’t draw them forward. Neutral was his expression, but he didn’t allow for silence to settle and cause further tension to grow. “I’m not a native citizen of Sunberth, Aer’wyn. The blood infused prejudice against mages is not something I partake in. I’ve seen magics both wonderful and horrifying. And I’ll wait until I know you better before determining if you’re nefarious in your practice or not.” That was as close to the truth as he was willing to go. Kynier suspected it would be enough for Aer’wyn to feel more at ease. He could’ve mentioned being a mage as well; though that would be blind optimism which he seldom experienced. Or Kynier could’ve mentioned that he worked for a wizard. But Doler wanted seclusion, so he didn’t think exposing the man’s existence would be doing him any favors. He finished returning to his normal set up and walked over to the beam that was supported a foot off the ground. Kynier sat on it and rested his elbows on his knees. “I’ve always wanted to do something to damage the slave trade. Sunberth has a significant market, and no law. Kelski thinks I’m an idealist for it. And she might be right. But… I still feel the need to do something.” As his mind trailed off it stumbled across a thought entertaining enough to make him chuckle. “So I guess I could accidentally bring some purpose for your work your way then,” he said a loud. The whole time Aer’wyn spoke, he watched Kynier closely. There was nothing in the mage however that betrayed his suspicion. Not even the slightly ominous chin stroking. A perfectly comforting neutrality as Kynier’s clothes returned to their place on their rightful owner. It put the akalak at ease a little more. Loosened his tongue and his rigid demeanour. A moment of uncertainty was completely decelerated with Kynier’s own revelations. A few more clues of the mage’s personality, a window into his world as he spoke of his origin in Nyka. Windows though which Aer’wyn was more than intrigued to look. He breathed a sigh of relief as he learned he wouldn’t loose his life to a mob on this day and though he would have never accused Kynier to be one of his own, he was glad at least to learn of his sympathy to the magic users. It was nice to see a chuckle come from the ever so rigid Kynier. He hadn’t hoped that the presence of such marked their immediate friendship but at least they had began to find some sort of a common language. Everyone had their ideas. And this one was shared not only by Kynier and Aer’wyn but by Vel as well. It was unusual in a way. Kynier had been raised during his more impressionable years by an eypharian wizard. The old man was already a master so Kynier had so many disciplines to choose from, and has selected those that seemed the most practical in usage. Yet as he met other mages, he found himself to have a wider spread knowledge base of magic to work with. The city of Sunberth wasn’t to blame for it. Like him these other mages had migrated from other cities for reasons that were their own. 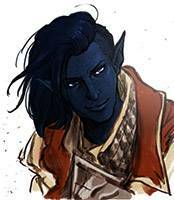 Gradually, he was being disillusioned to the idea that mages had access to several disciplines. Perhaps that was the true difference between a mage and a wizard. So when Aer’wyn admitted to only knowing the one form of magic, Kynier was inclined to think the akalak was lying at first. That perhaps Aer’wyn knew more but was hesitant to share a secret that threatened his life. But then Kynier thought it over with his spy tendencies pushed aside. Even outside of Sunberth, knowledge of magic wasn’t as rampant as it used to be. Through some twist of fate, Kynier had been given something that he couldn’t fully appreciate at the time. When Aer’wyn complemented Kynier’s objectives, the mage half smiled with some disbelief. It did feel like a noble cause. Yet it was something he had decided upon a long time ago. Years of experiencing the world on his own made it seem a little more foolish. But it was the only thing he had to hold onto. Kynier looked around the walls and the ceiling of the training room. Well… perhaps not the only thing anymore. And it seemed as though he was finding some common ground with the akalak, who offered his martial skill to aid him when needed. “Hopefully, I won’t need it soon. Though I really appreciate the offer.” The tension was dissipating from the room. Kynier could see it partially in Aer’wyn’s body language. The mage wanted to capitalize on it, but wasn’t sure what he should attempt to talk about with the male. Last time he had attempted to make pleasant conversation, the Vel persona had been rather closed off. Maybe now the mage could learn a little more about the other. Aer'wyn nodded in agreement. He was glad Kynier seemed like he was starting to warm up to him if even a little bit. The most he could truly ask for was for that door to remain open. For it was not in the warrior's interests to start picking unnecessary fights. "Only fools get things done." he jested, midnight blue lips curving up into a toothy smirk. "And you're certainly right there. Sunberth is well... an acquired taste, no offence. It certainly is the opposite of Riverfall in almost every aspect of it's hectic nature." He leant against the banister and looked at his hands in thoughtfulness for a moment. What reason could sound like a half truth at least? For reasons he had many. But he hardly doubted that Kynier was one to care for the many perils of his life story. "I suppose... it's a hard thing to admit one's shortcomings. But since you ask, I'd be grateful if you at least kept the embarrassing parts of my past to yourself. For you see life in Riverfall isn't all that easy either. There are many tests and trials young Akalaks have no ability to opt out of. And when my older brother died during one of his trials well... I was a coward back then. And no matter How much I wish to come back now, the shame would be too great." Looking back to Kynier he smiled softly, letting out a little breath of a chuckle to try and lighten the mood at least a little. Though there was very real grief in his eyes. For the death of his brother wasn't a lie. It was simply a half truth. "But one will never move forward, looking back to the past so constantly. I guess I see Sunberth as a fresh start." If you decide to return, PM me for your grade.